Learn more about unlocking all features. Set watched if you have watched this. Add to collection if you purchased (DVD, Blu-Ray) or downloaded this. Note On Android you can tap and hold most symbol-only buttons to show a brief description of what they do. From the show list, tap More options of a show. From the show list, tap the triangle-shaped filter shows button. Make sure that only Hidden is enabled. Tap More options of the show. Note After tapping the filter button use Remove all filters to restore the default shows list view. Note By default, show and episode data is updated regularly. From the show list, tap More options . Note You can force a re-download of all shows using Sync & Download all. From the show list, tap Open navigation drawer > Settings. Look for the Create backup section. Tap Select file for either shows, lists or movies to create a backup. Note On Android 4.3 and older you can not choose the backup file location. Instead SeriesGuide will store the backup files in the Download folder on your device. Look for the Restore backup section. Tap Select file for each type of data you want to restore and select the matching backup file. Tick the check box next to each type you want to restore. To restore your backup on another device, first transfer the created files to it. For example send yourself an email with the files attached, plug your device into a computer to access its storage or save the files to online storage. Note You can use a file manager app to view or copy the backup files. Tap the Restore Auto Backup button. If it is disabled, there is no backup available to restore from. Auto Backup will create a file-based weekly automatic backup of your shows, lists and movies. Note By default the Auto Backup files are saved to the Download/SeriesGuide/AutoBackup folder on your device (use a file manager to view it). On Android 4.4 and newer you can also specify a custom location for the backup files. Just disable the Use default backup files option, then select your preferred files. You can backup and sync using either SeriesGuide Cloud or trakt . Each has its advantages and disadvantages. Which one you want to use depends on the devices and apps you use. Note Unlike trakt, Cloud does not support marking movies as watched. Display trakt friends viewing history. Check into episodes and movies. Rate shows, episodes and movies. Note Unlike with Cloud, shows are not added automatically. But you can quickly access your trakt watchlist and watched and collected shows. Check-Ins are submitted immediately to trakt. But only with the next sync are checked-in episodes and movies marked as watched within SeriesGuide. Tap Open navigation drawer > Settings. Tap either SeriesGuide Cloud or trakt. Tap the sign in or connect button and follow the instructions. Note You can be connected to SeriesGuide Cloud and trakt at the same time. Setting watched and collected, commenting, rating and more will still be sent to trakt. However, check-in and sync with trakt will be disabled. Changes on the trakt website or other apps connected to trakt will not download. Note You can always change your mind! First, disconnect both SeriesGuide Cloud and trakt. Then, sign into only one of them. The data on your device will be merged with the existing data on the service. If available, SeriesGuide will use the language your Android device is set to. Otherwise it will fall back to English. To change the language of your Android device look in the Android Settings app. Note All translations come from amazing volunteers who translate on crowdin. Please consider to translate or proof read as well! Note SeriesGuide adds a show in the language you have chosen using the globe icon. Tap on the show to view its overview screen. Swipe to the Show tab. Tap the globe icon . In Settings > Basics you can set an Alternative Language. The alternative language will be used if no translation or poster in the language chosen for a particular show is available. Note If a translation is missing, help contribute one. and for movies is themoviedb.org . Both are open, user-maintained databases. Consider to help those projects by adding or updating information! Note: The TVDB ID has to be linked under External IDs. Using the highest rated show poster in your language. The poster for your language. You can not watch shows or movies within SeriesGuide. 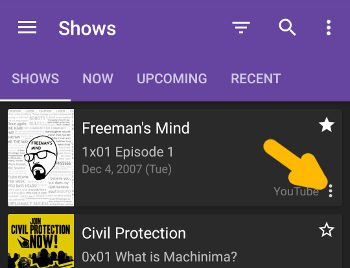 However, at the bottom of episode and movie details screens you can add extensions which allow you to search on popular services for streaming or purchasing content. Try to change the language of the show, most often to English. If you prefer another language, change the alternative language in settings to English instead. You can try clearing the cache for SeriesGuide. Open navigation drawer , then tap Settings > Advanced > Clear image cache. This should point you to the Android Settings screen to do it. If your current connection is metered and this setting is enabled, no images are downloaded. Open navigation drawer , then tap Settings. Disable the setting. If an episode is not watched and this setting is enabled, the episode image remains hidden. Open navigation drawer , then tap Settings > Basics. Disable the setting. Note Information might not be available, yet or your connection is temporarily broken (it happens, the internet is not perfect). Try again later. Make sure Sync & Update is enabled in SeriesGuide settings and you have a working internet connection. Make sure that Auto-sync data is enabled in your devices Settings app (on Android 5 and up, see Accounts > More options ; on Android 4.4 and below, see Data usage > More options ). Try to exclude SeriesGuide from overreaching power optimizations. If all is configured correctly, try to manually update the show. As a last resort, remove the show and add it again. Please send a message. Or consider to translate or proof read. You can help improve translation at the data sources. The show/episode release times are restricted to the original release in the country of origin. Tip If you want local listings and listings of re-broadcasts, please look for a suitable TV guide offering in your region. If the release country is known, SeriesGuide assumes the release time is in a time zone of this country (for example Eastern Time for US shows, British Time for British shows, Central European Time for German shows, ...). Then it is converted to your device time zone. If the release country is not known, SeriesGuide will assume the country to be the United States of America. You can view the country in the detailed show information. Info If your device is set to a US mainland time zone, SeriesGuide will automatically adjust the release time (for example one hour earlier in Central Time). If the displayed country is not correct it can be changed at the data source. If the country is correct, but you believe the release time is incorrectly converted in SeriesGuide, please drop a message. If search can't find a show, try these tips. Make sure Auto Update is working. Otherwise, you can check or help update the information at the data source. You may have moved SeriesGuide to the SD card/external storage. For SeriesGuide to work properly it has to be installed on your device/internal memory. Move it back and everything should be fine again (if not, try rebooting your device). If that is not the case, it may help to exclude SeriesGuide from overreaching power optimizations. Tap the switch app button on your device. Swipe SeriesGuide away or tap the X button. Launch the SeriesGuide app again. If that won't help, try to update all shows. Tap Connect and follow the onscreen instructions. Troubleshooting If you can't connect (white screen, error message), trakt may currently be unreachable (check status.trakt.tv, @trakt and @SeriesGuide for status updates). Please try again later. Try to turn off any proxy or VPN (for example for ad blocking). Try to clear the SeriesGuide cache (in Android Settings, in Apps find SeriesGuide, then tap Clear Cache). When using a privacy tool (for example a Xposed module), make sure SeriesGuide has access to the Android account system. It needs an account to store your trakt credentials and sync. If your issue persists, please contact me about what is going wrong (send a screenshot if possible). From the shows list, tap the add button . Tap the Watched, Collection or Watchlist button. Tap the plus button next to a show or use the add all button at the top. See notes about syncing in SeriesGuide. Check-in to let friends or the world know what you are watching right now. Checking in requires you to connect SeriesGuide only with trakt. After the runtime of the episode or movie has passed, the episode or movie will be set watched on your trakt profile and in SeriesGuide. Still lost? Send a message! Post to the SeriesGuide Community or email me.